In the treasure-trove of lighthearted, silly musicals, Howard Ashman and Alan Menken’s “Little Shop of Horrors” has to one of the most universally beloved. Based on a “B” horror film by Roger Corman, twisted to be firmly tongue-in-cheek, it becomes a send-up of every element of early 1960s cultural framework. Now the Whittier Community Theatre brings the show to the stage once more, accompanied by a live band and filled with a youthful energy. The tale is silly from the start. Seymour Krelborn and Audrey work at Mushnik’s Florist Shop on Skid Row. For obvious reasons, the store is struggling until Seymour produces one of his collection of exotic plants – a completely unique piece of vegetation which fascinates the public and makes the shop famous. As they cope with the rising fame, and the unique dietary habits of the plant, Seymour also worries over how to save Audrey from her sadistic boyfriend, and whether the fame he’s achieving is worth the emotional and physical cost. 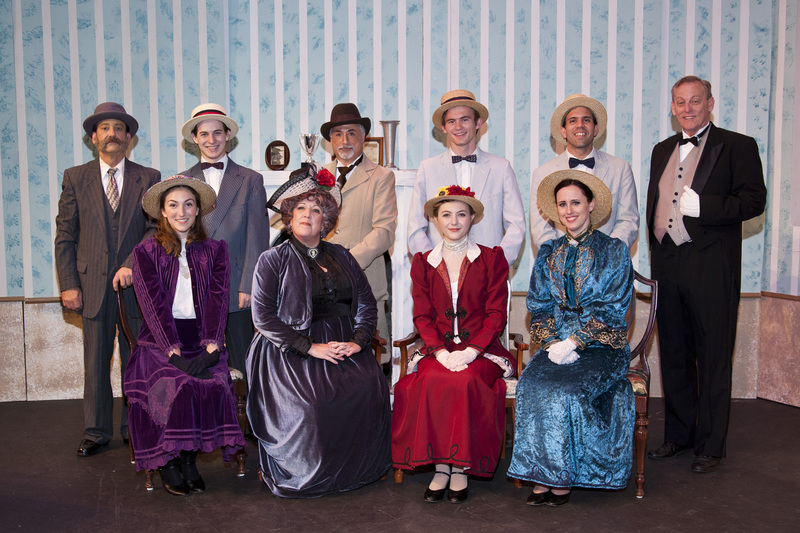 Director Karen Jacobson has gathered a sharp cast to bring this lovely trifle to life. Jonathan Tupanjanin sings up a storm and looks appropriately nerdy as the hapless Seymour. Mallory Kerwin matches Tupanjanin note for note, and certainly acts the part as the voluptuously innocent Audrey. Richard De Vicaris appears in his element as the crusty, accusatory Mushnik. Matthew Berardi puts his all into the slimy boyfriend who orders Audrey around. The show’s only major issue, which touches the leads but is most frustrating with the narrating chorus, is the uneven power and effectiveness of the performer’s body mics. Most particularly with the chorus, Mindy Duong’s Chiffon and Gracie Lacey’s Chrystal go back and forth between whose mic is on too loud, and Jenae Denise Thompson’s Ronnette often seems to not have a mic at all, which destroys the classic girl-group harmonies of their signature moments. The performers themselves sing well (though Lacey is sometimes a touch flat) but when you can only hear one of them at a time, the impact is less than stellar. Sam Maytubby and Steven Sandborn handle the physical maneuvers of the plant life, soon named Audrey II, while Bear C.A. Sanchez gives the plant a dominating voice. The rest of the cast, an ensemble of skid row residents, sing very well, move necessary set pieces when needed, and provide a few cameo parts. Kevin Wiley’s five piece ensemble provides some of the best musical accompaniment I’ve heard at a WCT production. Indeed, with the exception of the mic glitches, the show proves one of the most polished musicals of their recent past. Kudos go to Mark and Suzanne Frederickson for the set design, which offers a chance for the quick scenic moves so necessary to this fast-paced tale. Patty Rangel and Nancy Tyler provide just the right costumes to make the piece work. 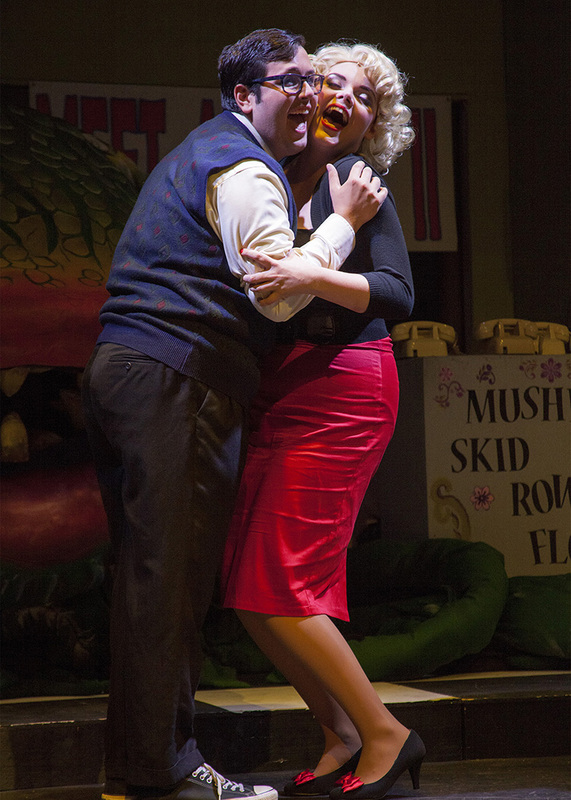 With “Little Shop of Horrors” WCT marks the start of their 94th season. That alone is worthy of recognition. That they should be able to put up an essentially amateur production with the qualities found in this one is both remarkable and deeply satisfying. Go take a look. You’ll laugh a lot, especially if you’ve never seen the show, and help support a venerable institution working to stay relevant long into the future. On the short list of 20th century playwrights whose work I love in part because if their rich use of language, James Goldman is right up there. Take, as example, his play “The Lion in Winter.” In many ways it proves very talky, but this drama pitting King Henry II of England against his sons, his imprisoned wife, and the King of France remains a constant favorite because the characterizations are rich, and the talk is clever, fast-paced and unrelentingly poetic. It’s a feast for the both the imagination and the ear. Yet this can all careen off the tracks if the pace is too slow, or broken up too much. Heat drives this play, and heat onstage dissipates quickly if not constantly fed. Which brings me to the new production at Whittier Community Theater. The cast is, particularly in the two most central parts, excellent. The costuming and feel of the piece are right. But constant breaks in the pacing, caused by the need to move furniture between each one of the short vignette-like scenes, make it excruciatingly long. In the process, that elemental heat cools. This is fixable, but it will take some creative restaging along the way. That would be wonderful, because rather than listening to an audience groan at the length, it would be terrific to be able to embrace this show for all the things it does right. They are many. William Crisp makes a terrific Henry – playing the elaborate game of political competition with relish, bringing a consistency to this medieval king even as he is wound-able, strong, afraid of aging, and admiring of intellect equal to his own. Candy Beck tackles the prodigious Eleanor of Aquitaine, Henry’s wife, nemesis, equal, and prisoner let out for Christmas. In a subtle supporting role, and despite a somewhat questionable wig, Jamie Sowers proves on a par with these two powerful and powerfully played characters as the young Alais, sister to the King of France, raised at Henry’s court to be the next queen, yet become Henry’s mistress. Her subtle strength makes her less of a pawn than often played, leading to a particular inclusion in this fascinating trio. The portraits of Henry’s three sons are a bit variable, though they power the piece when necessary. 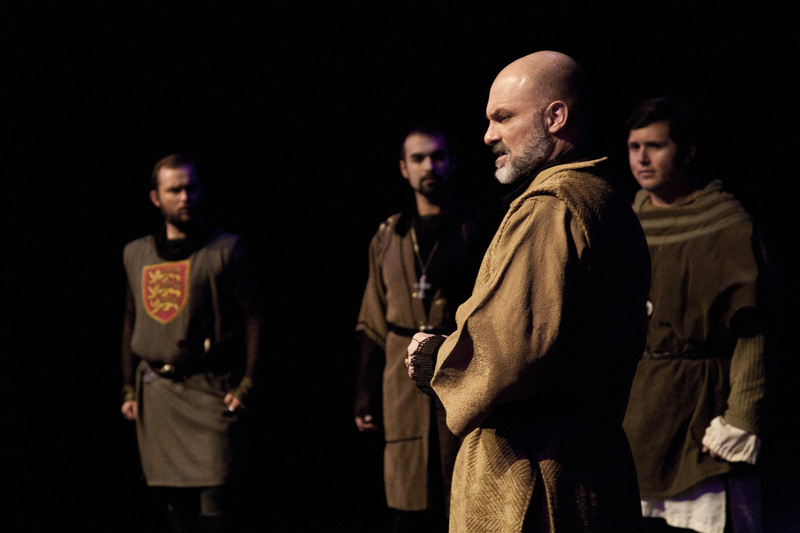 Colin McDowell’s Richard the Lionheart manages the mix of fragility and power necessary, but tends to deliver his lines in a comparatively hollow tone. Jonathan Tupanjanin makes Prince John just as much a spoiled child as is necessary. Thanks to one mention of his being pimply in the script, he has been given facial spots which look like large measles or major melanomas, and are very distracting. Acne is a bit more subtle, even onstage. Brandon Ferruccio makes middle son Geoffrey as frankly devious as can be, becoming the most memorable of the sons. Despite another odd wig, Luke Miller makes the young king of France subtly mature and even more subtly as devious in his own way as Geoffrey. It’s an interesting take on the character. Karen Jacobson and Nancy Tyler are to be celebrated for finding costumes which truly fit the characters and the time period. Set designer Mark Frederickson has created the impression of a medieval castle, which sets the tone, but as used may also be creating much of the problem. In the hands of director Lenore Stjerne, every scene is centrally staged, and uses the entire set. This means that between each scene lights dim, stagehands come out and move furniture, place or replace candles, hang tapestries, etc. – a project which can take 3 minutes or so. That’s too long, as pacing is key to effectiveness in this play. The use of “trucks,” which allow the quick wheeling in and out of setting pieces, or simply isolating some scenes in one part of the stage which is preset for the purpose, would solve this show’s one major problem and let people go home about a half hour earlier. And that would be good, because this version of “The Lion in Winter” is definitely worth seeing, especially for the performances of the two leads. Hopefully the timing glitches will be solved by the start of the second weekend.